Time for a Check-In with TNCS Dean of School/Head of Lower School! The New Century School expanded its administrative structure this year, allowing each team member to fully engage in their respective roles. As Shara Khon Duncan become year-round Head of School, Alicia Danyali became Head of the Lower School as well as schoolwide Dean of Students. Immersed will do an annual check-in with each Head, and this post represents the first such piece. In her 6 years’ tenure at TNCS, Ms. Danyali has always been interested in what she calls an “invisible curriculum,” which is her way of referring to the soft skills (norms, values, and beliefs) that children need to develop to grow as human beings. Nevertheless, as Head of the entire school before the reorganization, she did not have the breadth to undertake as many initiatives as she might have liked. She feels confident, though, that she began “planting the seeds” among the student body, and expectations were established. The TNCS student models the school’s four Core Values, Courage Compassion, Service, and Respect. In preschool, which is also her Head of School focus, she did not launch any big initiatives to allow them the first quarter to settle in and acclimate to their new environment. “We have some plans later in the year when the primary students are a little bit more mature and they can partner with organizations and understand the meaning a little bit more,” said Ms. Danyali. As for preprimary, they will partner up with the primary classes. “They’re not going to do service learning, per se, but they will learn how to socialize in a group—to feel comfortable around other people and pick up on social cues as well as learn how to be a little independent,” she said. Thus, Sra. Lala’s class teams up with Mrs. Bowling’s class, Sra. Salas with Ms. Mosby, and Song Laoshi with Mrs. Reynolds. One example is making hummus as a group (Sra. Salas’s and Ms. Mosby’s classes), mixing all the ingredients and smelling, touching, and tasting. The class pairs also had their Thanksgiving feasts together for another opportunity for those partnerships to solidify as well as to bring the parent communities together. “The primary mentors love to be good role models for the younger students. They make decorations together, they set the table together . . . all of those things that are a big part of the Montessori philosophy of practical life—of taking care of self, of taking care of our community,” she said. Of course, the mentor–mentee relationship reaches the other way as well. Thus, the primary classes get their own chance to be taken under the wing of older students. The non-nappers in Ms. Mosby’s class, for example, will join Ge Laoshi’s K/1st students to be video pen pals with a class of Chinese Montessori students, who are taught by former TNCS teacher Yang Yang, who is now back in China. They communicate in Mandarin and English. They also get a chance to have stories read to them by their older reading buddies. Here again, the partnerships will work both ways, with Ge Laoshi’s students also partnering with Ms. Sharma’s 4th- and 5th-graders on a weekly basis, to help take care of the school grounds as well as taking out the trash and the recycling from classrooms. The older students showed the younger ones the ropes and also made sure they stayed safe as they progressed about the campus. They will help make sure the TNCS environment looks its best! Meanwhile, Ms. Shaffer’s K/1st class will work with Ms. Madrazo’s 6th- through 8th-graders in reading groups—in students’ choice of language. As part of the invisible curriculum, Ms. Danyali has been doing workshops on social and emotional learning using nonverbal cues. Pairs of students decide on a sound and a movement they will make together, then they find another pair and combine the two sounds and movements into one. This keeps growing until everyone has been gathered together making one big sound and movement. “It shows how much there is to be said for nonverbal communication and what that means in our place in the world. How we can go anywhere and understand each other if we have a common sound and movement—nonverbal cues,” said Ms Danyali. “I focus a lot on navigating emotions and feelings and identifying what they are. In the 2nd- and 3rd-grade classes, in particular, the social dynamic has been really interesting. It seems like this is when social cliques start, and exclusion can happen. So, we will really be working on inclusion with them before we set them out into the world,” she said. In elementary and middle school, service learning really ramps up. In weekly meetings with the older students (Grades 4 through 8), Ms. Danyali discusses possibilities for class partnership activities and wider school initiatives as well as planning for future endeavors. Based on a recent presentation from a student from McDonogh School on her experience with grant-writing for charities (blog post on that to come! ), the older group is going to take on their own grant-writing initiative, for example. Ms. Danyali is not new to service learning, having been the Service Coordinator at other schools, and service itself is an intrinsic value for her. “Service has always a big part of my life personally, and it helps put things in perspective about what’s really important,” she said. It comes from my parents, my grandparents—that feeling like it’s part of your makeup, that’s just what you do. Of course, it has served me well because I feel like it’s a huge benefit to me to appreciate what I have. I find it really fulfilling when I know it’s made a difference. But I also have a hard time saying no sometimes, so it’s important also to keep a balance. Elementary and middle school students will have quarterly field trips that are service or community oriented in one way or another. The 8th-grade students will embark on the first-ever TNCS international trip, which is still being planned. Book fairs will take place, as usual, including an online Mandarin book fair. These and other school fundraisers will make use of parent and student volunteers, as appropriate. Ms. Danyali also works closely with the TNCS Parent Council who host their own set of initiatives to raise money for the school. Even initiatives with a clear fundraising bent help contribute to the TNCS thriving sense of community. “I feel really proud that we’re not even halfway through the school year, and we have already done so much as a school community,” she concluded. TNCS Students Fill Up with Kindness! As the third quarter of the 2017–2018 school year ramps up at The New Century School, Head of School Alicia Danyali is introducing a brand-new initiative in character development as part of her invisible curriculum that is one of the distinguishing features of TNCS. Although new, the latest initiative integrates well with other programs she has put in place over the years, especially last year’s four pillars of the TNCS learner profile, in which, schoolwide, students began exploring actively implementing Compassion, Courage, Respect, and Service into their daily school lives. Even as those concepts continue to define TNCS students and inform their academic pursuits, Mrs. Danyali seeks ways to make them more and more concrete as well as apply them in new and meaningful ways. Maybe you’ve noticed some different behaviors at home and wondered what suddenly jumpstarted your child’s development . . . well, there’s a good chance it started in class at school. Mrs, Danyali has brought bucket-filling to each and every classroom at TNCS, sowing bucket-filling seeds among the 2-year-olds all the way up to the middle-schoolers. “I feel like we’ve done a thorough discussion about character development,” she said, “and it’s time for putting words into practice. Bucket-filling looks different in different age groups, as it should, because I don’t have the same expectations of a toddler as I do of a 6th- or 7th-grader.” As such, she has distributed books and shared the concept in every class in varying length and depth. Younger classes were in a group setting and older classes in circles (see TNCS Brings It Full Circle with Restorative Practices! for her work with circles) that allowed individual student feedback. Overall, such student feedback has been very positive, and teachers are also getting into the spirit by regularly using the language of bucket-filling in their classrooms. For the 3rd- through 7th-graders, putting bucket-filling into practice involves reflecting and responding in journals. They were given notebooks with suggestions for each of 30 days on how to be a bucket-filler, or they could go off script and record their approach. “It doesn’t mean to be a bucket-filler to everyone you meet,” explains Mrs. Danyali. “But it uses the same line of questioning every day and then asks the student to be reflective. In our follow-up, I’m curious to see how much they share or choose not to share, but they know that there is no specific expectation to be met through the journaling exercise.” In other words, they’ll get out of it what they put into it! In other divisions, bucket-filling will take different, age-appropriate forms. At the 2- and 3-year old level, for example, the discussion centers more on, “what would you do?” in a given situation. In one of the K–1st-grade classes, students put a pom-pom in a makeshift bucket each time they did or said something bucket-worthy. In this way, the teacher made the concept less abstract, and students were able to visualize how good deeds literally filled their class bucket. It also demonstrated the value of working together, and even the children who didn’t initially grasp the concept (getting a bit stuck on their beach shovels and pails) came away thinking, “Wow, what a nice class we have!” Others came to the “aha moment” by hearing fellow students share during circle time, such as one child’s story of her twice yearly closet clean-out to donate clothes she has outgrown to needier children. For the whole school, art teacher Jenny Miller created a giant bucket for the multipurpose room wall so teachers can publicly recognize students who are exhibiting positive behaviors. Nevertheless, Mrs. Danyali is quick to note that acknowledgment is not what underpins bucket-filling: “What I really want them to take away from this is that you don’t always need recognition for doing something kind. Having more of a humble attitude and just knowing, ‘this is who I am and this is built into me’ and modeling positive behavior is the essence of bucket-filling, to my mind.” In fact, a newer concept to emerge from the bucket-filling juggernaut is “putting your lid on your bucket,” which basically means making sure that you are holding on to your positive energy and being sustained by it rather than going through the motions of bucket-filling just to impress somebody else. There are many facets to bucket-filling, and its implications are far-reaching. For example, another component to bucket-filling is taking responsibility for not-so-nice actions, which can also contribute to an affirmative environment and, in that sense, is reflective of restorative practice. Another aspect concerns the Dr. Jekyll of bucket-filling. For instance, if you’re not being an active bucket-filler, let’s hope you aren’t becoming the dreaded “bucket-dipper,” which is consciously subverting classroom rules or refusing to take accountability for a transgression and thereby depleting someone else’s bucket. You can also deplete your own bucket by such a negative attitude. Fortunately, trying to find ways and strategies to turn it around leads back to bucket-filling. She noted that, so far, bucket-filing seemed to resonate most with students who are already strongly connected to service, but she thinks it’s going to catch on more and more as TNCS students cultivate their character strengths and grow and develop. “Becoming a bucket-filling classroom” is a thing, but Mrs. Danyali is hesitant to invite too much fanfare. She prefers to keep it “organic and authentic” to TNCS, which means that it must be differentiated among levels and it will be implemented differently in each classroom. All of the materials are available in Spanish so there may be opportunity for some bilingual bucket-filling. Other schools even make bucket-filling into a competition, but that is something Mrs. Danyali will not bring to TNCS, as competing is diametrically opposed to what she feels is the point of this whole endeavor—which is more or less to become aware of our how our conduct affects our fellows and ourselves. If you’d like to reinforce bucket-filling at home and elsewhere, resources abound. The website (www.bucketfillers101.com/) provides useful information as well as links to social media platforms including YouTube, Instagram, Facebook, and more, showing everything from having a positive influence in how we talk, how we bucket-fill at home, and how it can be done in the community at large. TNCS’s Inaugural Student Awards Ceremony! Head of School Alicia Danyali leads The New Century School in many ways, not just practically and administratively. She mentors in unseen realms as well, gently promulgating what she calls her “invisible curriculum” that fosters kindness among students. During the 2016–2017 school year, Mrs. Danyali debuted the four pillars of TNCS, Compassion, Courage, Service, and Respect, as a cornerstone of her invisible curriculum and held biweekly student assemblies to discuss what these concepts mean in practice—how students can apply them to their daily lives. Later in last school year, she began implementing restorative circles in the classroom, which can be used to heal rifts as well as be simple communication forums. These also allow her to maintain relationships with all of her students, something as important to her as running TNCS. We have all worked very hard on identifying what makes a TNCS learner, and there are four words that can describe each and every one of you. They are compassion, courage, respect, and service, and they’re shown in different ways throughout the school day—what you do in the classroom that exemplifies one or more of these qualities. I met with your teachers and other staff, and we talked about all of the ways you exhibit the TNCS learning profile. So we are going to honor those of you at the end of each quarter who are representative of our TNCS learner. I want to emphasize that all of you have demonstrated all of these qualities, everyone has. But today we are acknowledging students who have really stood out during the first quarter. In the compassion category, Bridghid, William, and Desmond stood out by having empathy for a friend; for helping out a fellow student in the classroom; or for helping students work through an academic or social problem. Schonbeck and Ryan exemplified courage in the first quarter by adapting to new environments and making new friends. In the category of respect, two students—Flora and Mia—markedly demonstrated the proper behavior expected of the TNCS student. Chloe and Livia went above and beyond in service without being asked to help. TNCS theatre workshop instructor Alex Hewett. 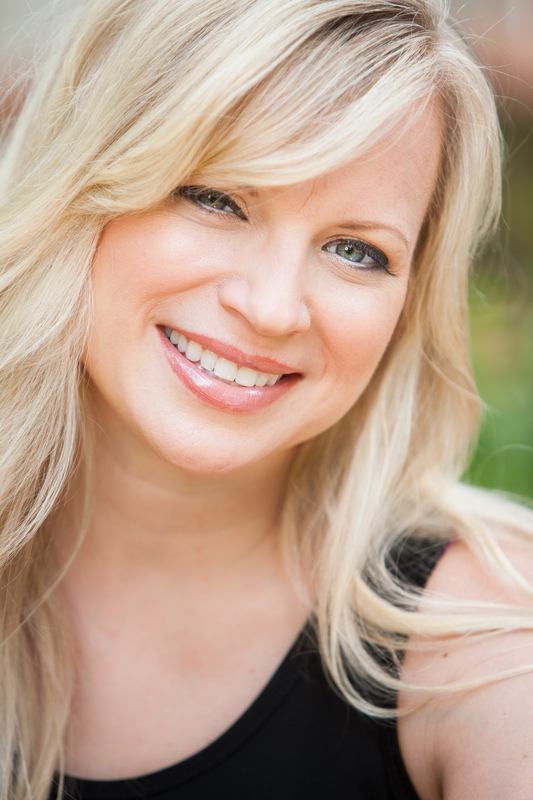 Ms. Hewett is an accomplished actress in her own right and deeply believes that skills an actor/actress uses on stage translate to daily life. These skills can make us better communicators, boost our self-confidence and self-esteem, and help us trust one another—collaborate and cooperate. 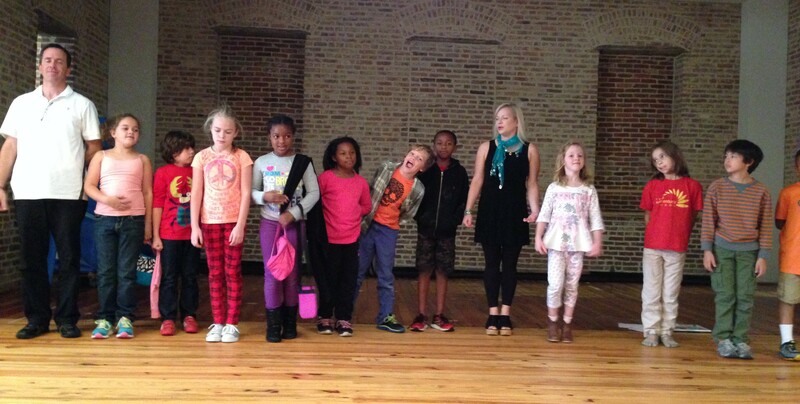 For all of these reasons, TNCS Head of School Alicia Danyali asked Ms. Hewett to host theatre workshops for the elementary classes, as part of what she calls her “invisible curriculum” to foster community, empathy, and respect. “Kids this age can find it challenging to work together because they are so full of individual energy,” said Ms. Hewett. “It’s a matter of taking that energy and using it on stage. We’re told in society to be quiet all the time, but then how do we express ourselves? That can be especially confusing for kids because they have a lot of questions; they have a lot to say. On stage, you have the freedom to express yourself.” There’s also a therapeutic component to theatre, which, for Mr. McGonigal’s homeroom class, took the form of a big expenditure of energy followed by several minutes of calm. Students were asked to collectively make the loudest noise they could—the subsequent screams were deafening—and then laugh their biggest laughs. This is followed by holding hands with eyes closed in a circle to harness their collective energy. “See what happens when we work together?” she asks the group. “Working together” is a phrase she repeats frequently, because team-building is really the thrust of this special class. She also emphasizes how the actions of one impact the group as a whole, which sends the dual message that each student belongs to this community and must show respect to its members and likewise that each is an important contributor and deserves that same respect. Finally, they lie on stage in utter stillness, completely abandoning movement, speech, and thought for several minutes. The latter is no easy task for 8-year-olds, but they have worked up to it, and their ability to focus has clearly benefitted. In fact, all of these preparatory techniques have multiple benefits: They transition the students from the classroom to the stage, help them block out distractions, and provide a form of release. As she guided the students gently into deep savasana (“corpse pose”), she explained in a whisper that this helps them relax and get attuned to their surroundings and themselves, gain self-control, and learn self-discipline. “If you are supposed to be dead on stage, for example, it’s not going to work if you are yawning or coughing.” Good point! Starting with Ms. Hewett and traveling around the circle, energy in the form of a gentle hand squeeze is passed to each participant to bond them and to share. These ladies are pros at relaxing and letting it all go! That’s not to say that the energetic kiddoes don’t lose focus from time to time, but Ms. Hewett knows how to bring them back and always keeps a sense of humor. “And a gentle hush fell over the crowd . . .” she intones when the students start to get overly boisterous, and quickly her “ladies and gentlemen” are back to the task at hand. The task at hand was rehearsal for a poem recital, in which they will alternate individual speaking parts and also speak some lines all together. But first Ms. Hewett had a fun way to physically demonstrate the results of well done collaboration. Together, they became a “machine.” “One little tiny screw falls off a machine, and the whole thing no longer works,” she said. “So I’m going to tell you one very specific thing to do, but don’t start until I tell you to start.” She configured them on stage, and away they went! Ms. Hewett knows how to coax optimal performance from these kids. “How many times a day are you told to be quiet,” she asked about midway through the machine exercise. “Well, this is your chance to be heard! Work the room!” She also fields directorial suggestions and praises the kids’ efforts to be so actively involved and creative. 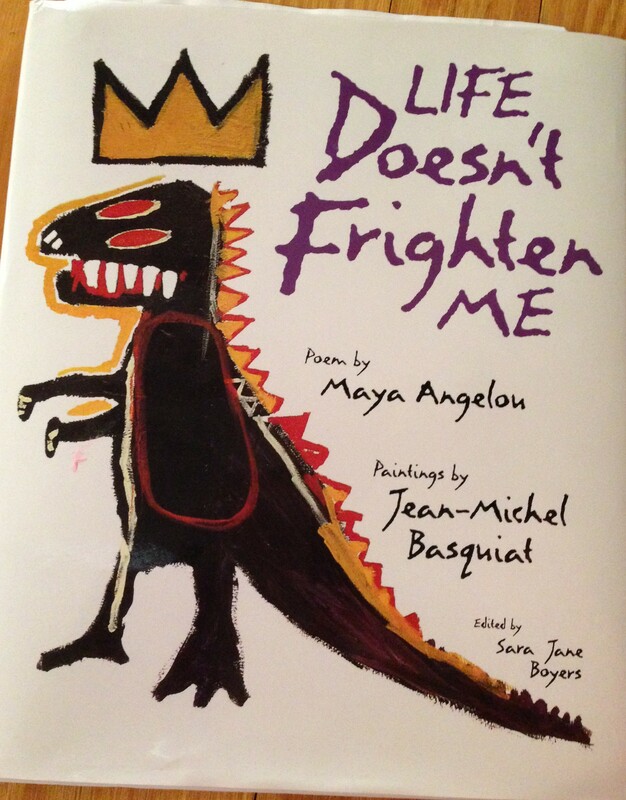 “Life Doesn’t Frighten Me” was written by Maya Angelou and illustrated by Jean-Michel Basquiat. For their performance, the students will read chunks of the poem, accent with sound effects, and intersperse poem stanzas with excerpts from their own personal experience of what they might be afraid of. In preparation for this piece, each student stood and told “their story”—what frightens them. Ms. Hewett encouraged them to use strong voices and be proud. She praised one girl’s improvement in projecting and making herself heard over last week when she was considerably more timid on stage. And that is a lesson we could all benefit from learning! The class lines up to take a group bow after their hard work during rehearsal. Well done kids!